How Often Do You Need Water Heater Maintenance? Are you frustrated with the lack of hot water in your home? Do you feel like you’re constantly dealing with puddles around your water heater, freezing pipes, or even problems with serious fluctuations in water temperature? If so, then it sounds like your water heater is in need of some serious maintenance. Water heater maintenance isn’t only important because it helps to keep you warm in the colder months. Damaged or broken water heaters also put you and your family at risk for severe burns. But how often should you conduct water heater maintenance, and what are the signs that something isn’t right with your water heater? How Often Should You Repair/Replace Your Water Heater? First up, let’s talk about how often you need to conduct water heater maintenance. In general, the overall lifespan of your water heater will be anywhere from eight to twelve years. Of course, there are several factors that can influence this lifespan. Where you place the water heater in your home, how well it was installed, the actual make/model of the heater itself, and even the level of maintenance you give it will all make a difference. In terms of repairs and maintenance, the professionals suggest having your water heater flushed out at least once every year. Essentially, this means that your tank will be emptied out through a hose, and then refilled with clean water. This helps to get extra sediment out of your heater, which, if left untreated, can cause serious damage and clogs to your system. The maintenance may also include an inspection and deep cleaning of the water heater’s coils, rods, and other pieces. Now that you have a more general timeline of how often you need water heater maintenance? It’s time to start taking a closer look at the signs that something’s a little off with your heater. If you notice any of the following signs, you should take action as soon as possible. After all, broken water heaters may explode, causing serious injury to you or your family. Keep reading to learn the signs that you need to look out for. Of course, you’ll know that you need water heater maintenance when you spy a leak or a big puddle surrounding your heater. However, not all the signs of a leak are quite so obvious. In general, you should make it a habit to check for leaks around your hot water heater at least once a month. Look for drips, a damp carpet, or even a musty smell surrounding the heater. No one like dealing with low water pressure, but it’s also a sign that you’re in need of some water heater maintenance. This is likely a sign that a buildup of minerals or other types of sediment. The pressure may also be low because of a kink in a pipe, or simply because of faulty installation. Your water heater will make a few random sounds that aren’t cause for concern. However, if you start to hear constant clanging, clicking, or even something that sounds like popping? It’s likely a sign of a more serious issue. Usually, what’s happening is that your heater is actually overheating, because it’s overcompensating for clogs in the system. Not only will this run up your hot water bill, it could also lead to an increased risk for burns if you come into contact with the heater. Another sure sign that something isn’t quite right with your water heater? Take a look at the water coming out of your faucets. Is it rusty and reddish-brown in color? If you’ve tried to drink it, does it have an overly metallic taste? Does your water just look dirty all of the time? If so, then you’re absolutely in need of water heater maintenance. This is because it’s likely that the pipes themselves have started to rust. In some cases, you might be able to handle this issue on your own, without the help of a professional. Start by draining as much of the hot water as you can out of your heater. (For safety, we suggest using a five-gallon bucket.) Usually, if you’re still seeing that reddish-brown color after the third five-gallon bucket? It means that it’s the problem with your water heater, not actually your pipes. If this is the case, then it’s best to rely on the services of a professional. They’ll be able to more completely drain your tank, and they’ll likely take a look at the overall quality of your pipes, as well. Remember, when in doubt, always rely on the services of a professional when it comes to water heater maintenance. Looking For Professional Water Heater Maintenance Services? We hope that this post has helped you to better understand not only how often you should maintain your water heater, but also that you now know the signs of potential damage to look out for. Above all, we suggest that you start taking care of these problems sooner rather than later. Doing so will prevent you from running into more severe — and more expensive — problems with your water heater down the line. It will also extend its overall lifespan. 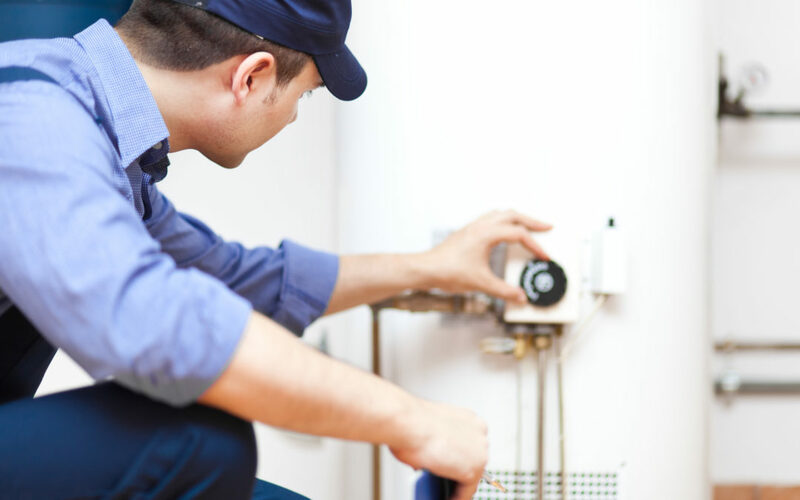 Looking for reliable and expert maintenance for your hot water heater? If so, we’ve got you covered. Spend some time on our website to learn more about the wide variety of services we offer, and get in touch with us for access to 24-hour service.